Cutaway is one of the goofiest films ever. 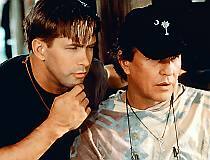 Baldwin plays an FBI agent named Vic who goes undercover and meets "Red Line" (Berenger) who is a skydiver. 'Line uses his skydiving skills with the help of "Turbo" (Rodman) to smuggle drugs. For a DTV film, this has a pretty big B-list cast. It also includes over-the-top performances by Ron Silver and Casper Van Dien. Silver shouts all of his lines, for example: "I'M YOUR PARTNER! THEY WERE SHOOTING AT ME!" Van Dien is just kinda there. Baldwin is very wooden as usual. He has one expression on his face: boredom. Berenger does a good job, but Rodman tries too hard. What's good about this film are the skydiving stunts. They look great. The rumor is that the cast did all of their own stunts. The best thing in the movie is a line by Vic's character when he gets "In Too Deep" - (whispering): "I'm Cutting Away". I guess that means you're getting away from life's problems. There's no need to get serious. Speaking of serious, the ending is a perfect example of melodrama. 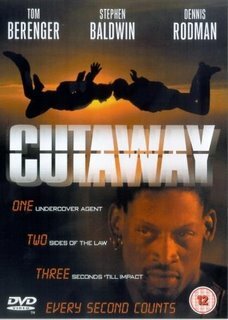 But overall, "Cutaway" is a fun movie if you're a fan of Stephen Baldwin, or Tom Berenger.